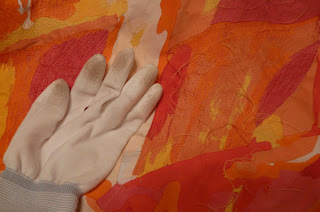 Each piece is traced from the reverse side onto the paper backing of Soft Fuse fusible web, cut out, fused to the back of my fabric (my own hand dyed sateen), then cut out again and assembled. 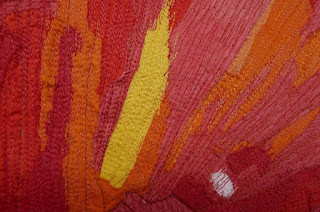 Lighter colors underlap darker colors. I separate the fusible from the darker fabric along the edge, insert the edge of the lighter fabric, and tack together with a hot iron. 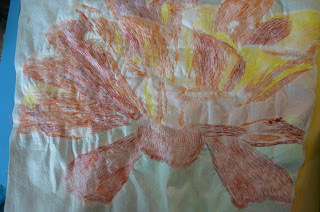 The trick is to keep the paper backing under everything or it will fuse to my drawing. I got about ¾ done in 4 long days, and the rest a few days later. 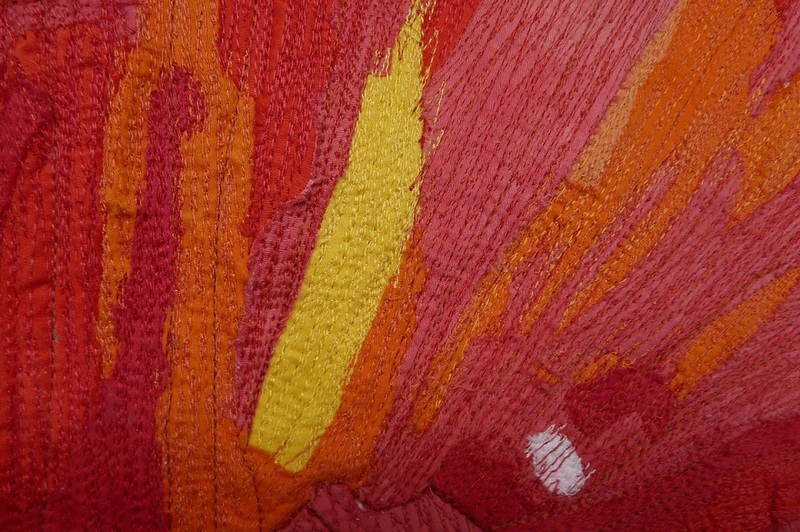 Next step involves lots of threadwork to blend the colors. Background will be solid black. Background fabric was added, and the whole top fused to DecorBond. Next, to choose thread colors. This glove was brand new a week ago. 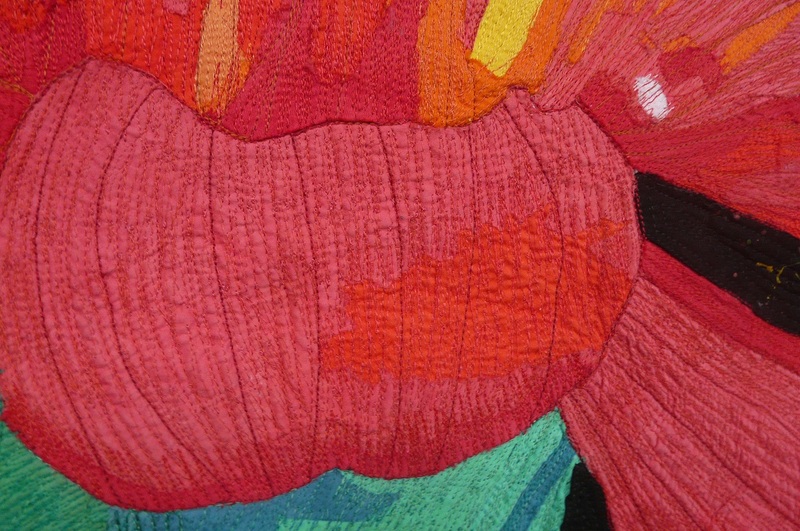 Threadwork almost complete. A zillion thread tails to pull to the backside. 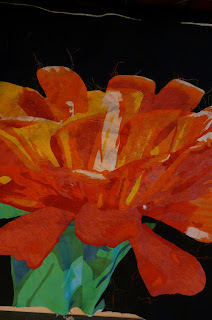 The background was quilted a week ago, but...the more I thought about it, the more unhappy I was with the quilting. 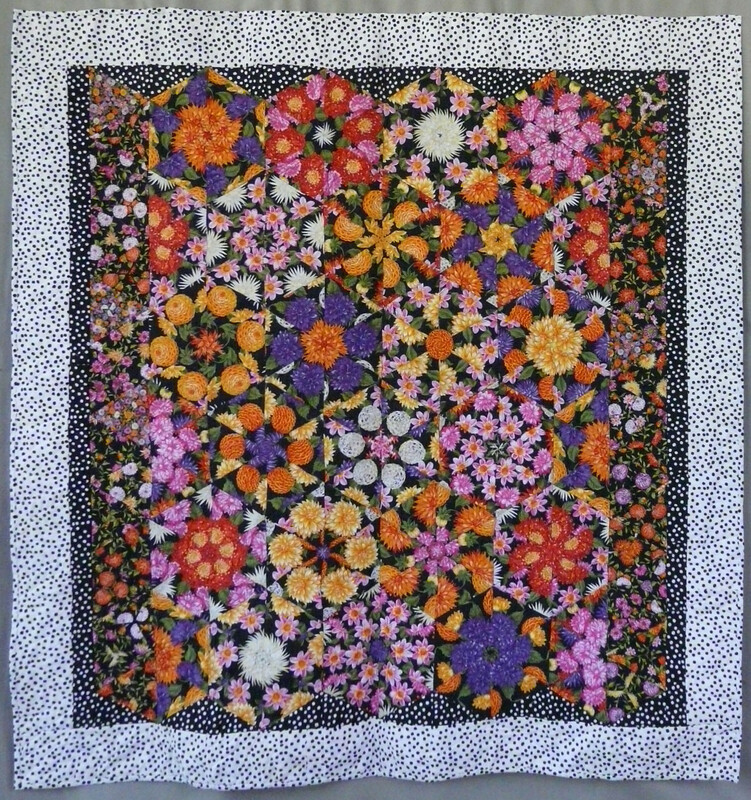 Lots of little tucks, and it did not flatten out with quilting. Part of the problem was that the entire top was fused to a sheet of DecorBond. 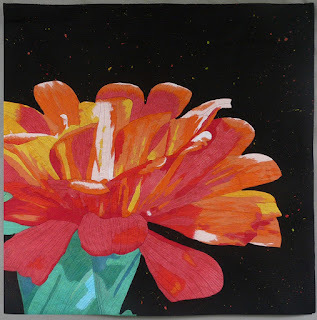 So, the rows closest to the flower were ripped out, and I carefully peeled up the edges of the black background and cut the decor bond around the edges of the flower fabric. I laid towels on my cutting table, dampened the flower on both sides, and ironed it flat. Had to cut along the edges of several petals to get things flat, but it finally is. The black background fabric was a bit stark, so the new background fabric is a bit more interesting, without being overpowering. 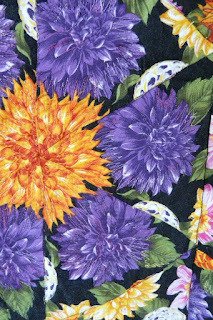 I basted thee flower to the back along the stitching lines, cut away the fabric over the flower, leaving a good inch or so. With a lot of careful clipping and trimming, I turned under the edge of the black, pinned, and stitched it down close to the edge, working on 8-12 inches at a a time. 5 hours later, the background was attached. 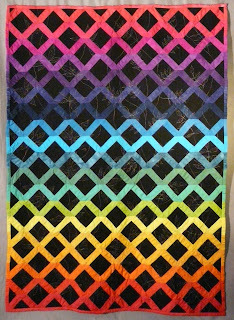 It’s basted, and the background is partially quilted now. And, this time, it’s flat! 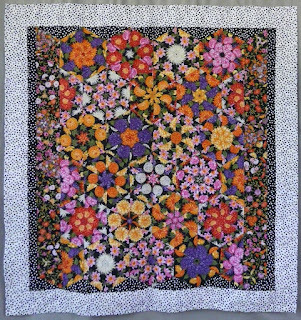 Quilting is finished! The back looks pretty cool, too. Completed! Even added the hanging sleeve, label, and wood strip for hanging. 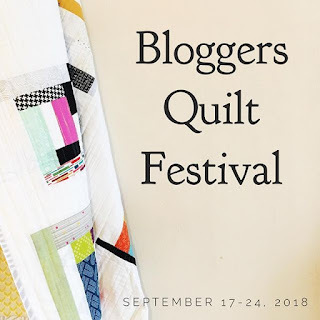 I participated in a quilt challenge a year ago, and while I was picking up my quilt, I picked up this year’s challenge packet. 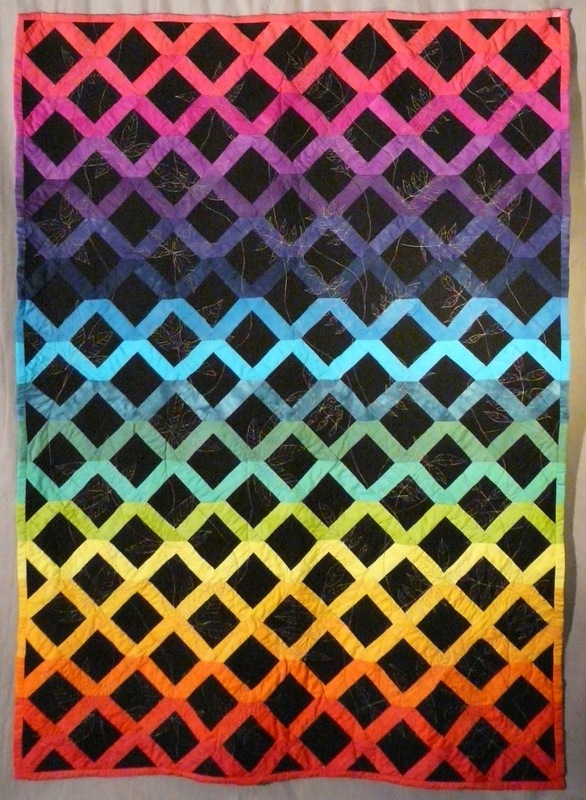 Since the shop is 2 hours from my home, I planned my quilt while still in the store, and bought an extra yard of the fabric to use for the background. 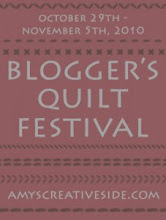 The theme this year is to use a traditional quilt block name and make a new interpretation of the name. 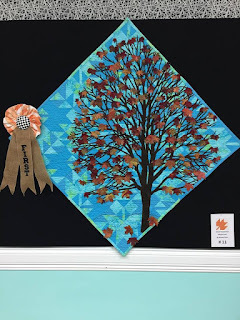 The quilt had to finish at 30 x 30, and use a recognizable amount of the challenge fabric. 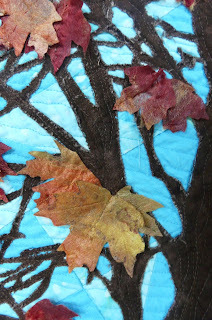 I had planned to do a maple tree interpreting the traditional maple leaf block, and to make the leaves from cast fiber. Since the finished size is 30 x 30, I decided to make the background from 6 inch blocks. I added 2 blue solids and flipped the color placement in each adjacent block. Next, I enlarged and printed out a drawing of a red maple tree to the size needed for the piece, laid it on the back, and traced it onto the paper side of Wonder Under. After fusing to brown fabric, it was carefully cut with embroidery scissors. I drew some concentric circles starting in the center of the paper, and cut out the center areas first, working outward to keep from handling the already-cut areas. 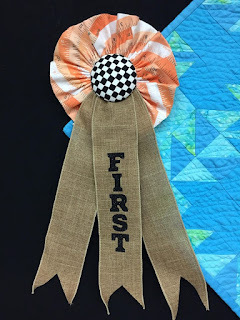 What’s left of my challenge fabric. 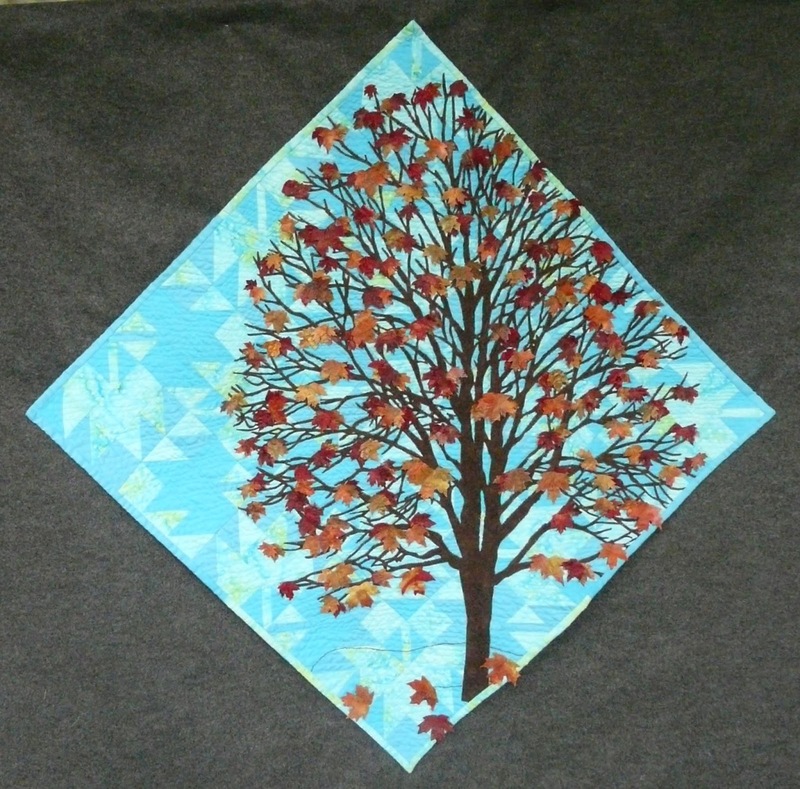 Cut out tree was carefully slid onto the quilt top, after peeling off the backing paper, then fused in place. Quilting started on the branches, shown from the back. 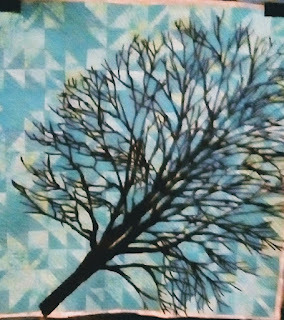 Tree is quilted, and background will be as well (backside of quilt). 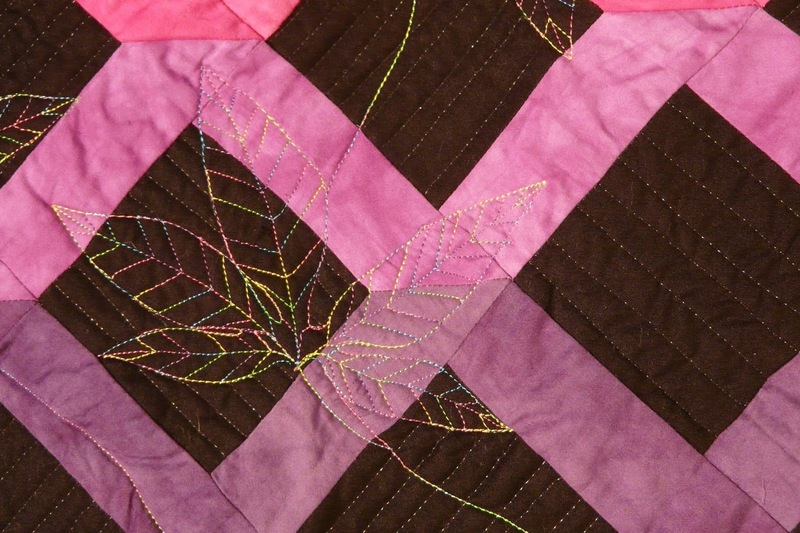 Lots of small spaces to quilt, and a ton of thread ends to pull to the inside. 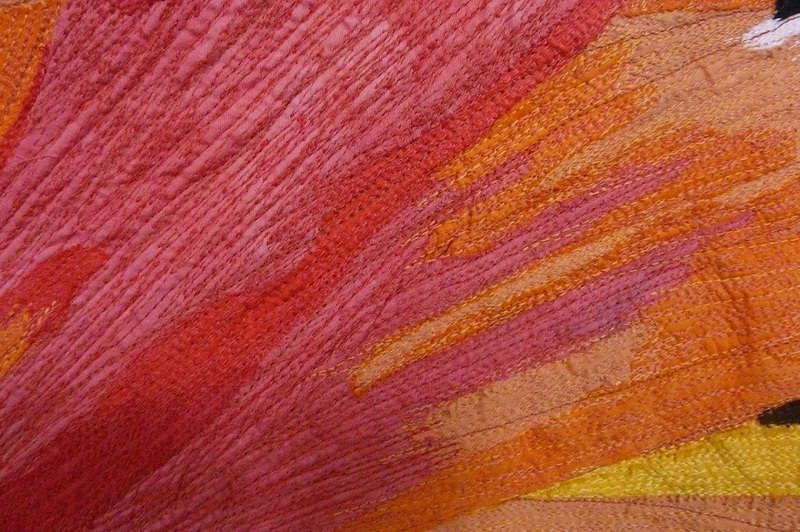 Cast fiber leaves, made by taking real leaves, covering with 2-3 layers of silk and bamboo roving, then wetted with soapy water, blotted, and brushed with textile medium. When dry, the leaf shapes are cut out & leaves peeled off. Casting leaves the imprint of the veins. More cast fiber leaves. You can see the imprint of the veins. Sometimes the leaves crumble and small pieces remain, as they did here. Sheet of cast fiber. 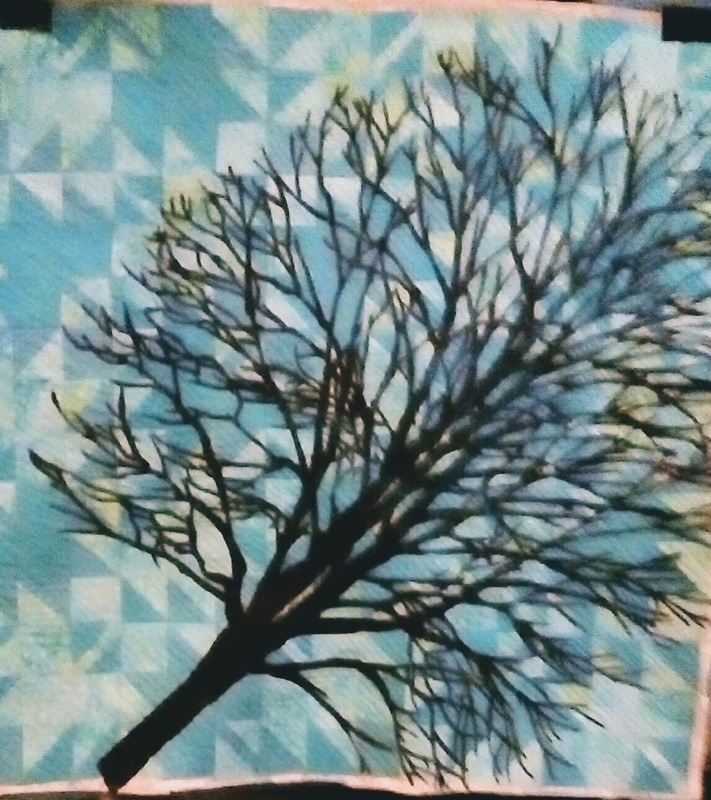 Leaves wind up on the bottom until it’s dry, then shapes are cut out and leaves are peeled off. Not enough leaves. I went to a friend’s house and gathered tiny new leaves from her Swamp red Maples. Filled a phone book, then cast them all a couple days later. Still looking sparse in the leaf department. 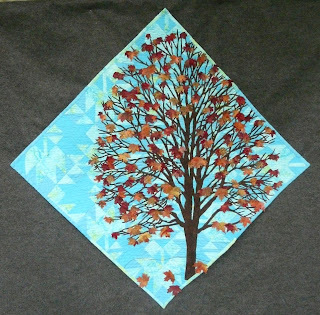 I made a sheet of cast fiber and cut leaf outlines, 4 at a time, to use behind other leaves. Maybe enough leaves now. Each is hand sewn down the center vein, leaving the edges free. A few lines were embroidered to suggest ground, and the last few leaves were attached. 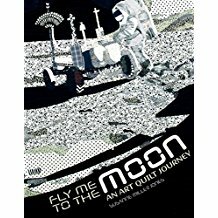 Fly Me To the Moon touring exhibit and book. 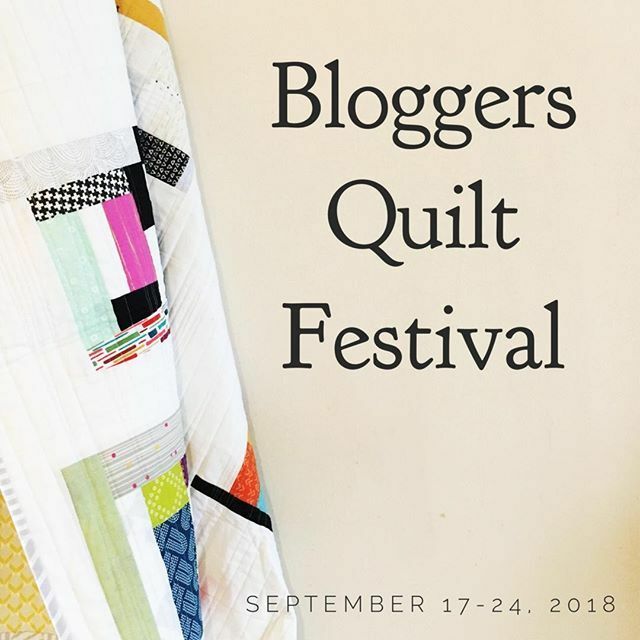 I have three quilts in the book and exhibit! Book pages 38, 45 & 50. 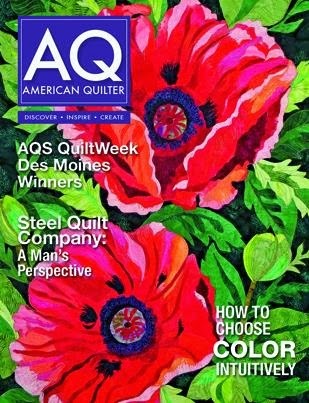 My quilt is in Quilters Newsletter! 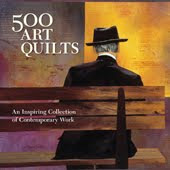 500 Art Quilts, published by Lark Books, available NOW! 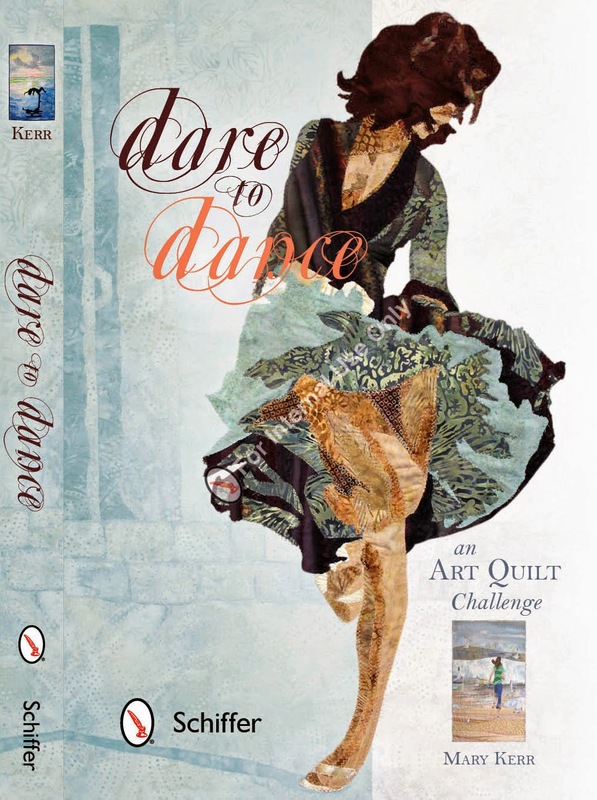 I'm on page 383! Fiber Artist: art quilts, unique garments and knitwear, costumes for Nutcracker and other ballets. 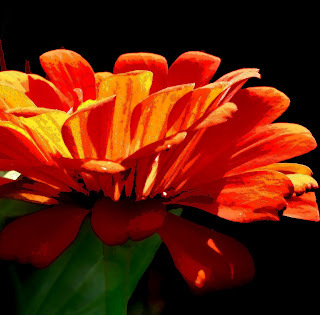 Photographer, nature, garden and pets. 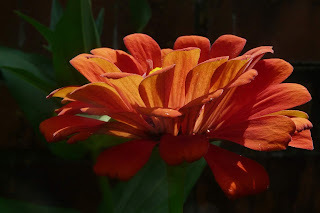 for links to artwork & etsy shop, see below. All artwork, photos and text on this website, unless otherwise acknowledged, are owned by wlstarn. Unauthorized use of images or text found on this site is theft. It's Ravelympics Time! My Ravatar!